Meet Destiny; a happy and affectionate girl with a great big heart full of so much love to share she can hardly contain it all. Destiny is full of enthusiasm and excitement and can't wait to sit down and tell her new family all about anything that may come to mind. Find a quiet place, bring some good snacks and juice, and you'll see the genuine spirit of this amazing child shine through as she entrust you with hearing what she has to say. Destiny enjoys attending school and is very capable academically. She likes to help her teachers and seems to do best in the classroom when she works on activities independently. She can become easily distracted and needs extra help, at times, to be quiet and stay focused. She prefers one on one attention in the classroom setting, as well as at home. Destiny looks forward to being able to play outside during recess and going on field trips with her class. 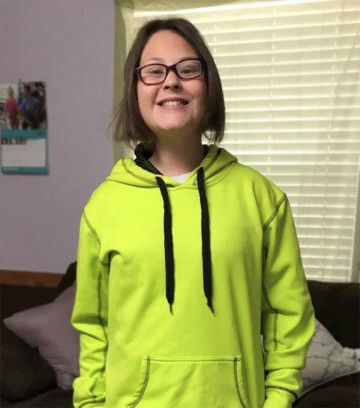 Destiny likes music and dancing; she'll give you a hug in no time; and loves going on a variety of family outings; especially going to church. Although she can be quite bold at times, she really is content with things staying simple and familiar where she can continue to grow and move forward in her ability to share love and attention with others. Destiny's forever family will be equipped to give her the commitment of a lifetime. They will be able to provide the strong consistency and structure Destiny needs along with the graceful flexibility afforded in a family atmosphere. The ideal parents will be prepared to offer close supervision as needed for Destiny and give her all the time she needs to feel safe within her new environment. A family who can provide Destiny with the one on one attention she needs will be a plus. She needs a family with the willingness to utilize community support that will benefit Destiny in the long run.